The saga of the flags on Iwo Jima has fascinated America for decades. Hammel himself grew up in the company of WWII veterans and has always been intrigued by 'The Photo' of the flag, which became a powerful symbol of patriotism and national pride. But the story of how the flag got there, and even the identity of the soldiers in the photo, has been muddied by history. Eric Hammel here sets the record straight, viewing complex events through the lens of the story of the infantry company in which all the flag raisers served. Joe Rosenthal's "Raising the Flag on Iwo Jima" photo is one of the best-known images of US war history. The photo captures the moment that the first American flag flew over the core of Imperial Japanese territory on the top of Mount Suribachi. The focus of this book lies on the 28th Marine Regiment's self-contained battle in February 1945 for Mount Suribachi, the 556-foot-high volcano on Iwo Jima. It was here that this one regiment defeated more than 1500 heavily armed Japanese combatants who were determined to hold the highest vantage point on the island. 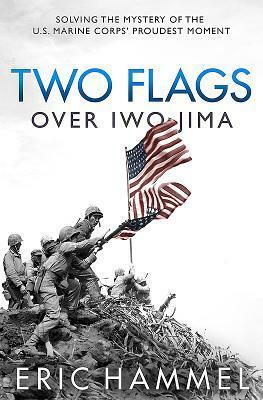 Two Flags over Iwo Jima reveals the all-but-forgotten first-flag raising and the aftermath of the popularization campaign undertaken by the post-WWII Marine Corps and national press. Hammel attempts to untangle the various battles which lead up to the first and second flag raisings, as well as following the men of the 28th Marine Regiment in the events which took place after. Not only is the full story behind one of the most iconic photographs ever taken revealed, but also the real heroism and stories of the men behind this most fervent expression of American patriotism.